One of the world's largest chat service providers is not applying UK Government guidelines on how to protect children online. The voluntary code, drawn up by government, law enforcers, industry leaders and children's charities is a response to an increased use of the net by paedophiles. Leading chatroom provider Yahoo has admitted that it has not yet implemented the guidelines and has set no timeframe to do so. Chatrooms can pose a particular danger to youngsters because they are easily accessible and there is no way of verifying whether the person a child is talking to is who they say they are. In the UK, there have been at least 12 cases of youngsters being physically attacked by men they originally met in chatrooms, say experts. Despite sitting on the committee which came up with the safety rules for net providers, Yahoo has no moderators keeping an eye on its chatrooms and has no easy way for children to report conversations they are uncomfortable with. 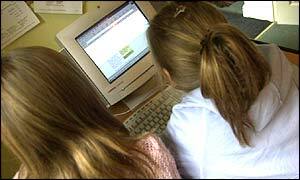 The guidelines also recommend that adult content is difficult for children to access but getting on to chatrooms is still very easy for children and adults alike. John Carr, another taskforce member and head of children's charity NCH Action for Children is clear about what operators should be doing. "These guidelines are a benchmark and we expect every responsible operator to enforce them," he said. He added that Yahoo had done much to clean up its act in recent years, employing a child protection specialist and making its website a more family-friendly environment. "But its chatrooms still do not conform to the guidelines," he said. One of the main factors seems to be that Yahoo UK has its decisions made by its parent company, Yahoo.com, which is based in the US. America has a very different attitude towards how the net should be regulated. "Historically America has a completely different attitude to these questions, due to its attitude towards free speech," said Mr Carr. "The mindset is that it is wrong for government to lay down laws and the ethos is that the internet is the Wild West - the last frontier," he added. The UK Government is aware that not all operators have taken the guidelines to heart. "We believe the industry will start to implement them and the public now has a benchmark to assess service providers by," said a Home Office spokesperson. There is some disparity among how UK chatroom providers have responded to the guidelines. Some, such as teen chatroom site Habbo Hotel, have great strides towards providing a safe environment for young surfers. Microsoft's MSN web service still does not have moderators in all of its chatrooms but has introduced a 'Stop Abuse' link in all its rooms, which provides information about how to deal with abusive chatters and how to contact moderators. "We have had incidences [of paedophiles] like all other chat providers but if we are notified of illegal behaviour we act on it," said MSN's Marketing Manager Shereen Meharg. In the latest version of MSN's software, there are parental controls that allow adults to ban children from chatrooms altogether she said.